This is a so called new flavor from the company. 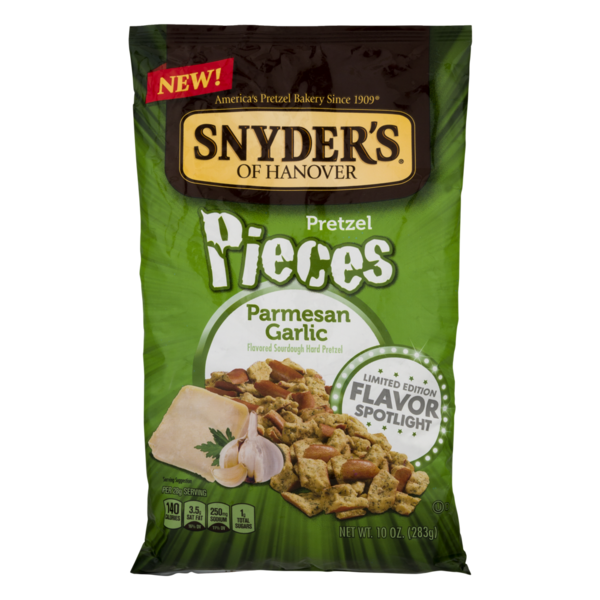 The pretzel pieces had nice a crunch to them. They were fully loaded with Garlic flavor. I will give this item a big thumbs up and if you really like garlic you will not be disappointed. I make a similar thing. One year we had some occasion at my house. It was a last minute thing, and needed to come up with something quick to put out for the company. I had box of hard pretzels in the pantry, most were broken up pieces. So, the light bulb went off. I broke all the unbroken ones into pieces. I heated up some oil, fried up a little mince garlic. Let it cool. Tossed the broken pretzel pieces in a large plastic container, added the garlic oil, covered and shook until coated, then tossed in some parmesan cheese , shook it up again. ( Kinda like Pretzel Garlic Knots). Put it out on a tray, and everyone loved them. Definitely a little greasy, so not something Id want a crowd of people digging into, then walking around my house touching everything, but it was a quick , throw together that worked out real well. My son loves the honey mustard ones. Havne't seen these yet, though. They used to have a pizza flavor that the hubbie loved.